The internet we know and love is under attack. Support the free and open internet by enabling our “Fight for Net Neutrality” plugin on your WordPress.com blog. The Federal Communications Commission has proposed rules that would, for the first time, expressly allow internet providers — like Comcast, Verizon and AT&T — to charge internet companies like Automattic, Netflix or Etsy for access to their subscribers. This means there could be “fast lanes” for companies who are able to pay providers for preferred internet access, while everyone else gets stuck in the “slow lane”…which means applications won’t perform as quickly, webpages will load slowly, and of course, buffering. A slow “still loading” spinner will be an unfortunate, but common sight on the new, closed internet that the big providers want. Unsurprisingly, the large telecom companies who stand to benefit from the FCC’s proposed rules fully support their passage. They have nearly unlimited funds and hundreds of lobbyists in Washington to promote these harmful new rules. But what they don’t have is you. Automattic strongly supports a free and open internet. After all, WordPress.com, and the WordPress open source project are living examples of what is possible on an unthrottled internet, open for creation, collaboration, and expression. Over the last few months, we’ve joined 150 major tech companies in sending a letter to Washington in support of net neutrality, and met with FCC Chairman Tom Wheeler to urge him to preserve the internet we’ve always known. Automattic, along with many other companies and digital rights organizations, is proud to participate in the Internet Slowdown on September 10. For this day of action, we’ve built a “Fight for Net Neutrality” plugin that you can enable now on your WordPress.com blog to show support for this important cause. 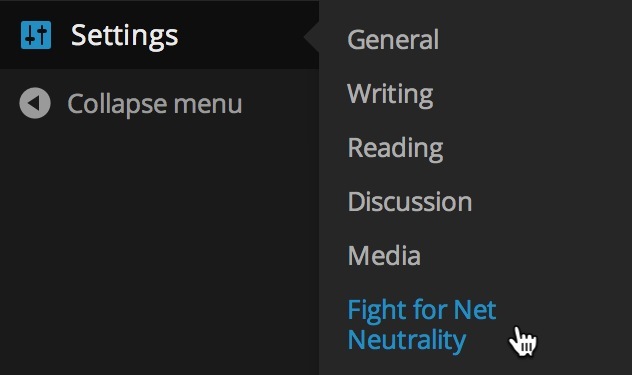 You can turn the plugin on by going to your Dashboard, Settings → Fight for Net Neutrality. When you enable the plugin, we’ll replace a few of the posts on your site with a “Still Loading” spinner…to show what life will be like on an internet that features dreaded slow lanes. 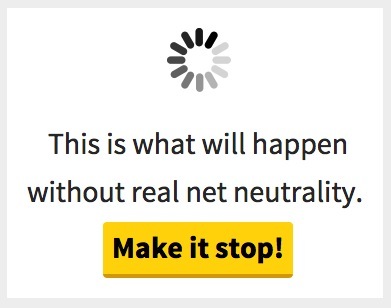 The plugin will also display a banner that shows your support for Net Neutrality, and links to battleforthenet.com, where visitors to your site can sign a letter to the FCC about this important issue. Please take a few minutes to enable the Fight for Net Neutrality on your site today, and visit battleforthenet.com to send a message to Washington that net neutrality must be preserved. Together we can make a difference, and we hope you’ll join us in this important battle for the open internet! I’m in the fight too! Thank you WordPress for giving us a voice!! What is happening outside the US? Anyone know? i’d like to know too. In any case, I joined. We’re all in this together. This website has all of the latest info about Net Neutrality in Canada: http://netneutrality.ca/. Thankfully “unjustly discriminate or give an undue or unreasonable preference toward any person, including itself, or subject any person to an undue or unreasonable disadvantage” is against our telecommunications act. Set my banner. Thanks for keeping us aware. Sometimes things aren’t noticed due to the business of life. This is definitely something I want to stop my rush, read and be a part of spreading the word. Mahalo for sharing not only the post, but the chance for us to share with our readers. Done and done. Thank you. Am onboard for this worthy cause! You have my full support . Thanks for taking this on! Will do! Ouch! I didn’t know this! Done! While I am Canadian, I think it’s a good idea for us too. Most of my readers seem to be American anyway. I am very happy to do what I can! Since I live behind the Great Firewall, I actually experience this and much worse on a daily basis. One of the things I love when back in the states is the free access and fast speeds of internet. I certainly hope it stays that way! Enabled. Thanks for leading the fight, and having your bloggers’ back. I shared this info on a site with 100,000 members. I hope they follow up! I am 100% behind this. Let’s keep the net neutral, folks! I have already posted the plugin on my blog. And I am asking all the WordPress bloggers in the US that I follow to do the same. Definitely onboard with this. Downloaded and supporting. Thanks guys. What a well written post- totally into this! Taking action on Net Neutrality! Reblogged this on i want to go to there.. Enabled on both my primary site and its companion site, but the positioning on the companion site is so far below the fold that it’s questionable if anyone would see it. I guess it depends on theme. Comcast alone has 70% of the market share with a 90%+ profit margin and a satisfaction rating lower than the IRS, already has the legal ‘right’ to dictate what you can post, what groups you join, and what you read on their ‘service’. i.e. internet (look at your contract, it’s in there they simply don’t enforce it). And now they and every other internet provider (half of whom they own anyway) want to tailor your internet speed for their personal profit? Enabled so that these money grubbers won’t be. We need to bring this fight to the telecommunications industry, too. Just remember T-Mobile is killing it with that free music options. I’m 100% with you! Internet was born free and thus it must go on. Done on all my blogs! Right with you. I love that the company I work for cares about these things. I’m so grateful for the participation decided upon by WordPress, along with those responsible for coordinating the beginnings. My husband and I chose to give up Cable television, because we were there when Cable television was born. We remember exactly what subscribers were paying for… and how much. Nothing of the sort exists today. The greed of Cable Television has stolen its own integrity. Now it wants to hijack the Internet. And I’m seeing commercials from our television, aired with our outdoor hdtv antenna, that they have lobbyists already working on hijacking ‘free television,’ as well. I have just a small website (www.chinterests.wordpress.com) but without WordPress, it wouldn’t be. So I’ve added the widget (brilliant … and truly annoying!) and a bit of explanation, as I’m in Canada. I’m just another drop in the bucket … but wouldn’t it be great if all the drops became a torrent, to smash cold water all over this plan by the already unchallenged cable company monopoly. By the way, even though it’s from June, the John Oliver piece is devastating. Loved it! See also Cybersecurity as Realpolitik by Dan Geer and John Oliver on Net Neutrality. This is akin to car companies telling you where you can drive your car. Imagine needing to pay a separate fee to use a school, church, or other non-corporate website. Or having them take so long to load they are effectively no longer accessible, thus censoring sites that internet providers don’t want you to see. Censoring non-illegal or non-pornographic sites in any way is a bad idea for anyone to allow; everybody should support this! It is similar to what they are doing to our roads. I pay taxes for highway and roads to be built, now they are creating more and more diamond lanes that I have to pay again to use, when I have already paid for them. The fact that they are doing the same for the internet is just annoying. money talks and lots of money shouts and drowns out those without. The infrastructure of the internet was given freely. Now they want to set up toll booths. Net Neutrality will determine what your internet looks like going forward. Inform yourself! Inform others! I’ve proudly posted the official widget on the O-152 site. Thanks for bringing this up. Is there a way to deactivate this plug-in? Once activated I no longer see it in my settings. Thanks for any info anyone can give. Thank you for allowing us to participate the way that you did yesterday. Any moves to do away with net neutrality are efforts to continue to reward the super-rich to the detriment of the great majority of the U.S. population. We urgently need efforts to decrease the gap between the rich and the poor, exactly the opposite of what the large corporations are working toward. I’m too late to support this as its no 13t September, but I am dead against the increasing corruption in Governments that constantlty working for a minority against the wellbeing of the majority. I thought the wars we fought were for freedom, but now the biggest danger comes from inside as our freedoms are reduced. I am the first to net neutrality in my community! Together for project success! I hope it works this time around. Not that it hasn’t worked before, it slowed them down all the other times, but it seems like with each iteration, we lose the interest of every day consumers. There’s an entire community of people who create things like WordPress that can go out of business if we don’t protest this. Business owners, talented creatives and people who love the web are all equally threatened. NO. Keep the government OUT of the internet. Obama has already indicated that ICANN will no longer have control of the roots of the internet, and we can already expect immediate censorship of web sites by bad actors like the thugs who run China, Iran, and North Korea. Be very careful what you advocate for, you might not like the results.